I love all those punches so neatly displayed. And her stamping area.Very organized. 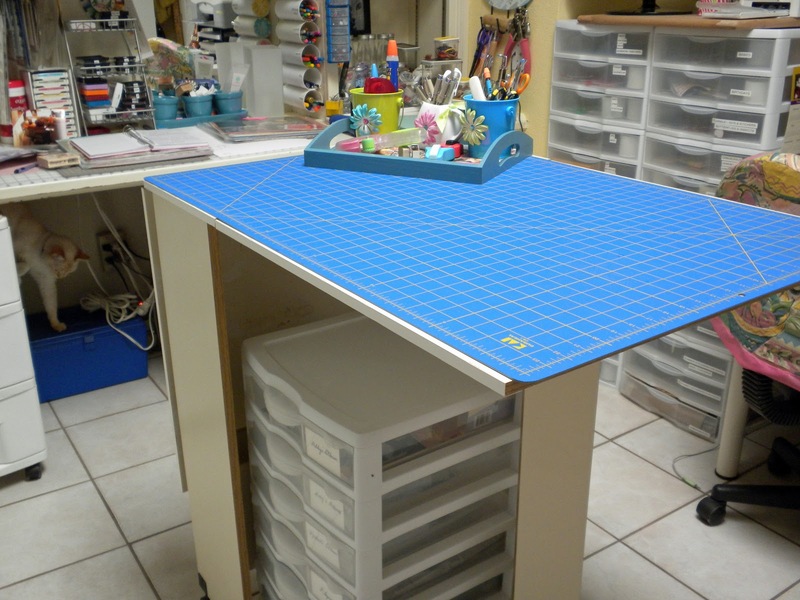 Carol's studio has sections or spaces for scrap booking, card making, sewing & quilting, plus general crafts & a computer station. Next month Agitte will celebrate her 25th aniversary in the craft business. She enjoyed: making dollhouses, embroidery, painting, scrapbooking, stamping, papercrafting, etc. She also loves organising. Through the years she found many great storage idea's. 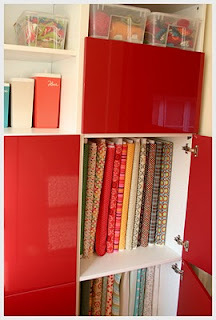 So a couple of months ago she started a blog with her great idea's, but you can also find storage idea's from other crafters. Check her blog entry here. Love this idea from Harriet Hensley. A silverware holder, as seen in a cafeteria or restaurant. 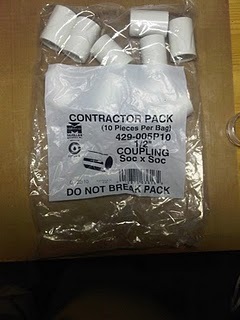 An additional advantage is the plastic holder can be removed and taken to your work table. So many different things to look at! As well as her Glitter glues. Click here for her blog. Is full of photos and explanations. 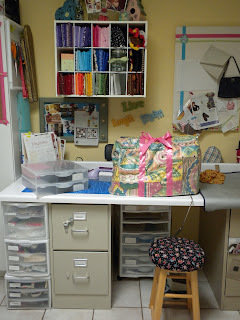 A multi-talented crafter, Cheri at I Am Momma - Hear Me Roar! 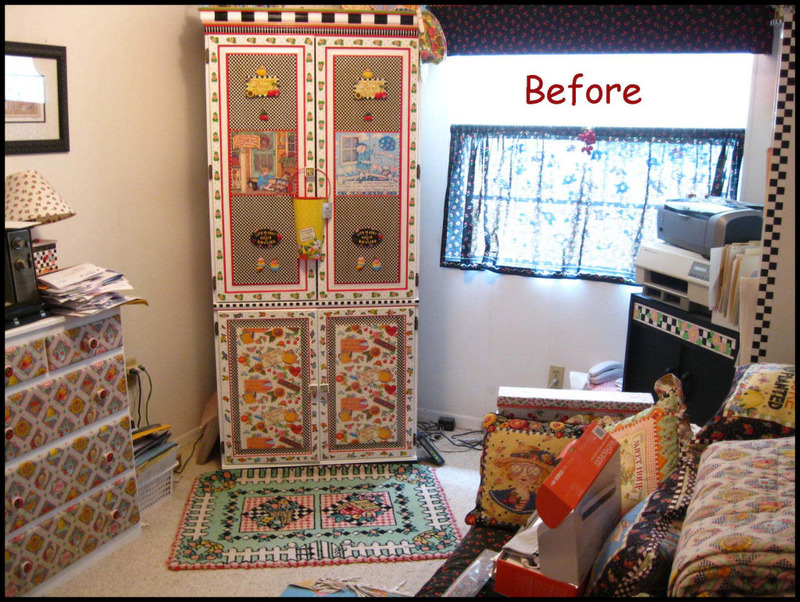 transformed her craft room from blah to WOW! Here's a photo of the "before:"
You can also see her in progress posts here and here. She has some super fun ideas, including an amazing peek-a-boo door to her sons' playroom next door! 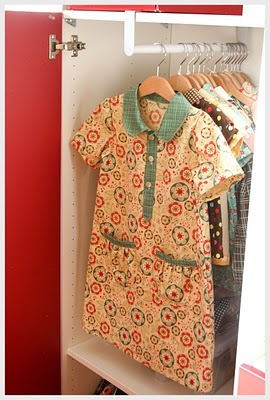 You can also see the post about her room on her blog. 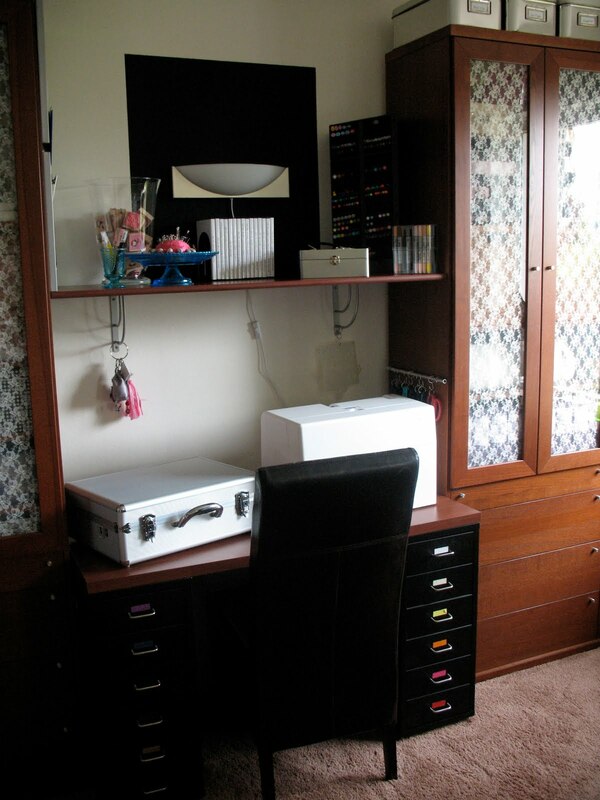 Be sure to leave her a comment, and let her know that Crafty Storage sent you! The Organized and Inspired Scrapbooker (it has great ideas for other crafts too) is back in print and available in a paperback format trough Amazon.com this fabulous book went out of print about 3 years ago and has been selling for upwards of $40 on ebay! 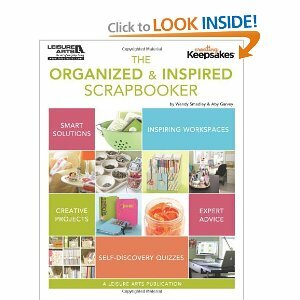 It is full of ideas and teaches you what style of storage works best for you trough diferent excersises. As soon as I saw this idea I was in love with it. Such as neat one, and on a budget too. 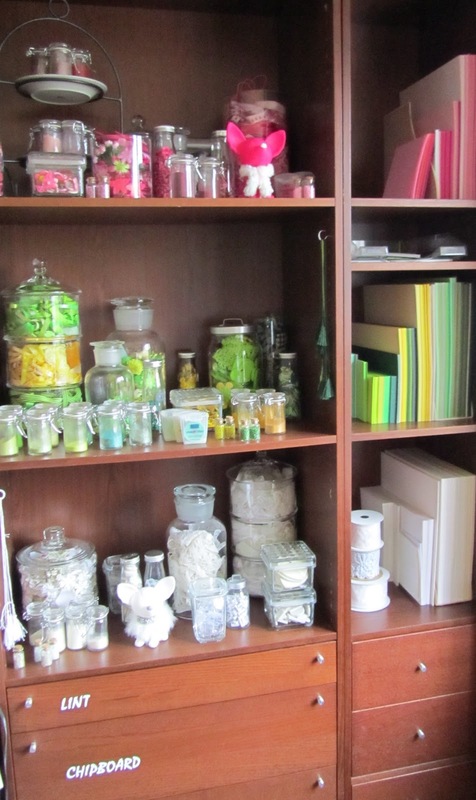 Perfect example of crafty storage. 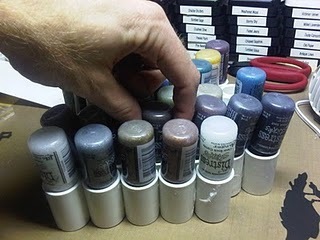 Check the exact details on how Ron did it on his blog here. And here for the post on the Adirondack acrylic dabbers stand. Moy's studio is full of stuff. Full of ideas. 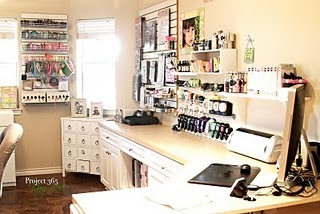 Check her blog here and her post about her studio here. Here there is one of her ideas. 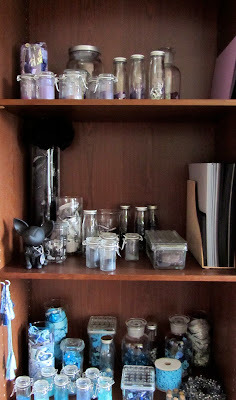 The day before yesterday Amy showed us how she stores her patterns, today a bit more on how she stores other stuff. Amy's cleverly used Ikea's shelves to store fabrics clothes and more. Click here for her post in her blog with more photos. 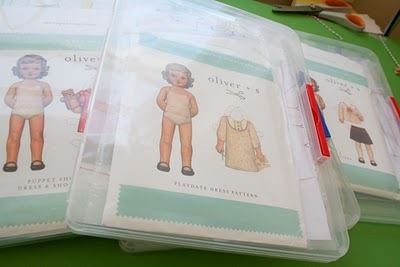 Check Amy's great idea on how to store patterns here. The day after tomorrow more ideas from Amy. 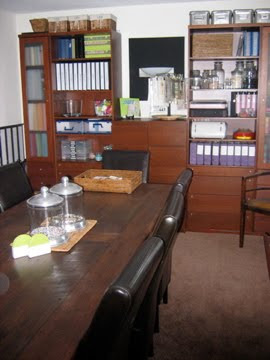 Check here Vicky's studio before and after plus a lot of photos and explanation. Check out Leslie's new studio here. Lovely, isn't it?